Ok, time to introduce Gelato Fiasco to everyone. Founded in 2007, they are a Maine based company that is already spreading throughout New England and into New York City. The founders, Bruno Tropeano and Joshua Davis, were just 24 years old when they started, yet claim to have over a thousand flavors in their "recipe vault". That creativity is teamed with their embrace of social media. Just consider the fact that they've got over 12,000 Facebook fans just waiting to catch a glimpse of the day's special. I know I'm excited, and now they've sent over a half dozen sample pints to help celebrate their new (recyclable) packaging design which also goes along with their pints switching to certified Maine organic milk and cream. First the bad news: Gelato Fiasco is testing out a few shipping methods and I this one got damaged in transport. Even after scraping the top layer off, this one is still pretty icy looking. It just figures out of six samples, I pick the one that had a bit of a rough journey. Thankfully I'm still tasting milk and the ice vibe is fairly limited, so not all hope is lost. And now the good news: I really like this flavor... A LOT. It's a very subtle blueberry flavoring, so I thank them for that. It's just so nice to have a subtle take on blueberry, I'm so tired of that fake blueberry flavor you find in everything. Sure a decade ago that fakeness amused me, but it wore me down over time. A flavor like this reminds me of what a blueberry can really do. My favorite part? The little crust bits that somehow add a touch of underlying flavor to every bite. It totally seals the deal for me. 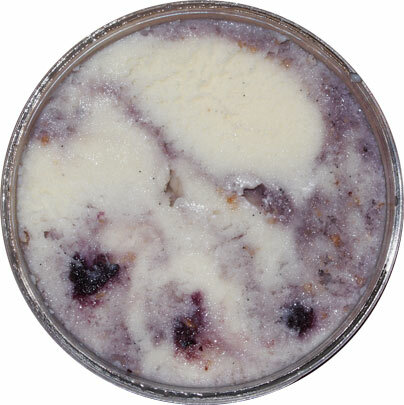 It's one thing to go searching for big crust bits in a flavor like this, but what I really want is to have that streusel flavor in every bite, whether or not I get a big chunk of it. I never want to forget about them. I want that constant contrast to the blueberries and I've got it here. Speaking of blueberries, they are present, but they never wallop you with a bitter taste or any kind of jarring texture change. They're pleasant, just like the rest of this gelato. So nice. This is just such a pleasant flavor that I don't want to stop scooping. It's like a delicate blueberry muffin flavor... actually it's like i mixed a blueberry muffin with some excellent ice cream. Man this is good stuff!! On Second (and third) Scoop: Yeah, I'm gonna miss this one. The flavor profile is really catchy. It feels familiar and comforting. This is a rare flavor indeed. Even damaged, this one is still awesome. That says a lot in my book. Stay tuned for the other flavor reviews, they're all top notch as well. Buy Again? would if I could! I just listened to The Nosh Show and heard you talk about the Strawberry Balsamic Gelato. I make this ice cream flavor all the time at the request of my children. We love it. You can't really taste vinegar but it just adds something to it. 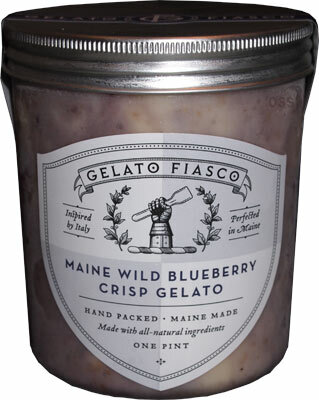 Unfortunately the pint of "Gelato Fiasco Maine Wild Blueberry Crisp" I purchased, was inundated throughout with ice crystals the size of coarse sea salt!!! The only thing this icy textural nightmare was missing, was the burnt electronics flavor of the dreaded freezer burn!!! Obviously it had melted and been refrozen, at least once, prior to purchase!!! Too bad, because they seem to have a solid hit here if only they can....well...keep it solid during shipping!!!!! @Troylet: any chance you can take it back to the store? That's what people always tell me though admittedly I'm pretty terrible at it. Ice crystals are the scourge of small ice cream & gelato makers. If you keep your formulas simple, you risk damaged product in transit. If you overdo it with the stabilizers, you get gummy products (which I hate). So yeah, I've had fresh pints of gelato fiasco (which is always excellent) and also a few wrecked pints of gelato fiasco which definitely took a lot of enjoyment out of the experience. Give them another shot if you can but feel free to wait for a sale or a fresh shipment.